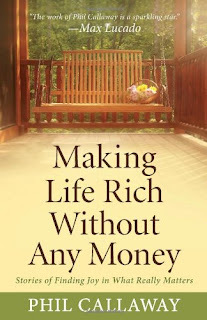 In this book, humorist Phil Callaway takes us through six characteristics of rich people, and by rich he is not referring to the monetarily wealthy. 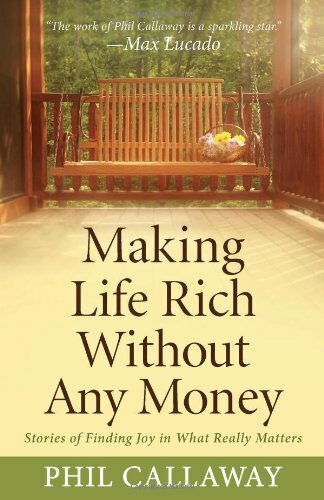 Instead of a book telling us how to become rich, the author instead takes on a journey of making life rich. The characteristics have nothing to do money in the bank but have everything to do living well. It took a little for me to get into the book, there is a few beginning chapters that go through some statistics which isn't my thing and seeing this book is already almost 20 years old, I sort of just scanned those. But the principles it lays out really are timeless. Nothing earth shatteringly new in them, but in Phil Calloway's trademark humor, you are relating and laughing along and sometimes without even realizing it you've learned both an eternal value and a life changing principle about what really matters and what really brings joy. I love his writing and this book is worth the read for the humor and the reminders of what really does make us rich. And I'll just say that any of his books are great. He takes hard life issues that most of us deal with at some time or another, wraps them in joy and humor and is able to spread a warm message of hope. Well, there is only one more day left to the month of November, so that will end my goal of knocking some of the non-fiction books that have been piling up in my closet out of the pile. I must say, I'm pretty proud of myself. I have read a total of 5 non-fiction books. That is some kind of record! And I enjoyed them all (though one of them was a difficult read), which is also another record. I read 2 autobiogrpahies, a memoir, a biography and I don't know where you'd classify this book: study book? self-help book (though it really isn't a SELF-help), essay? I don't know. Anyway, Yipee for me. I'm glad I did this, it really helped. I don't know why I pile up the non-fiction because I do generally like them once I get going on them. Now my pile is reduced to half of what it was. Good job! I have a harder time with non-fiction, too. Not so much biographies - though they're factual, they're often written as stories, and even if they aren't, I like following someone's life story. But I think with other non-fiction, I think of them like a textbook or something, like I need to remember all these details or life lessons, and then get frustrated when I don't. I've wrestled with ways to do that. Reviewing them helps. I do usually like them once I get going, but sometimes I get bogged down. Yet they're usually thoroughly worth the reading. I've seen his stuff on shelves in bookstores and library but I"ve never read one. I'd probably pass on this one but glad you got your non fiction reading in!! I'm still plugging along on one. started it in September! HAHAH...meanhwile i've probably finished 4-5 fiction books!! Hey, congratulations on reaching this milestone, and thanks for the review! I read a lot of non-fiction, but am planning to read more fiction next year.